Fusion 801 w/ 6550's Free shipping to the lower 48 states info@newtube.com From the round transformer covers to the quarter inch front panel of black or silver aluminum, the Fusion 801 is a clear statement of elegance. 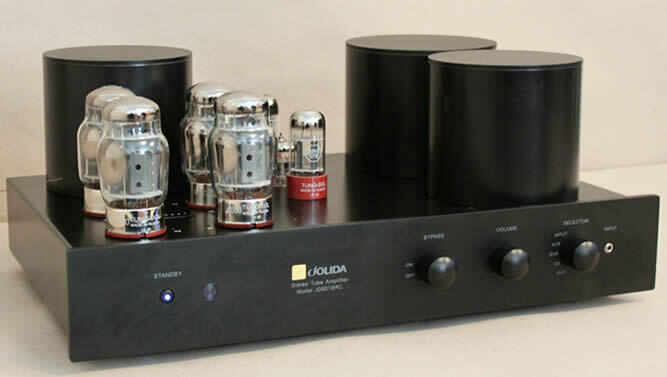 But don't let the styling fool you, the electronic heart of this amplifier has a sonic quality and reliability second to none.This integrated stereo tube amplifier can deliver resolution, soundstage and a warm, lush sound , which transforms background music into listening pleasure. Sales Policy : All sales are final no returns accepted.If any Jolida shipment is refused and or returned for any reason including a possible defect and no defect is found a 25% restocking fee will be imposed additionally customer will be responsible for all shipping charges to and from the shipping point.By placing an order you are accepting these terms.Free shipping applies to Domestic U.S. Locations only. Multiple Inputs: Front mounted selector switch-CD, DVD, Tuner and Aux. (for TV, VCR or Computer). Custom Wound Audio Transformers with a core of German grain oriented silicon steel. 15th generation proprietary design. Secondary can be configured for a 4 ohm or 8 ohm load. Top panel bias testing terminal with bias adjustment controls. State of the Art Components: ALPS Blue audio potentiometer, gold plated RCA input jacks, ESA Clarity .47uF coupling capacitors, carbon grid resistors. Low Feedback Design: Only 3 dB. Weight: 53 pounds (24 Kg) net, approximately 57 pounds (26 Kg) packaged.